I was raised in a rural town in the Cotswolds, playing in fields, running about and climbing trees. This eventually turned into hiking, mountain bike racing and getting stuck in to anything and everything, especially outdoor sports.My father is an engineering director in industry (retired) and my mother is an artist, lecturer and the Mayor of my home town. My Sister and young brother both attended the same comprehensive secondary school as me in nearby Cirencester where I successfully passed my GCSEs and then I went on to study A’Levels in Maths, Physics, Psychology and Art in the neighbouring Cirencester College. I decided that I wanted to join the armed service at the age of seventeen in my final year at college after attending a series of career meetings and getting stuck into the college career library. I remember taking a computerised ‘personality profile test’ which helped me draw these conclusions and it was from there that I started researching the Royal Navy and the numerous ways in which I could join. Finding the most suitable option for me was the hardest part. I decided to apply to join as a Marine Engineer Officer. 1992-1997 Cirencester Deer Park School. 1997-1999 Cirencester College. 1999-2000 BRNC, Dartmouth. 2000-2003 University of the West of England. Mechanical Engineering. 2004-2005 Oxford University. Mechanical Engineering. University Boat Race. 2004, 2005. I’m writing this blog on my laptop looking out over one of the most spectacular natural landscapes I have even seen. I’m in Stellenbosch, South Africa. Relating to rowing, South Africa, Training Camp. My teammate, Andy Hodge, and I were recently invited down to the Institute of Naval Medicine to be put through our paces by the physiology staff just to see how tough we really were. Relating to INM, Lungs, Marines. The weeks and (couple of) months after the Olympics have been the only time in 5 years when I have really had a chance to stop and think about what I’ve been doing all this time. The sacrifice, the friendships, the training, the racing, the failure and (thankfully more often) the success. The thought of being better and faster than before is scary as I know what it is going to take to get there. Relating to Pete Reed, Peter Reed, reed, royal navy. Yesterday morning on board HMS PRESIDENT, I was delighted to announce that the Royal Navy has offered to continue to sponsor me as an athlete until London 2012. With this support, it was an easy decision to continue to row for the next 4 years to aim for another gold medal at my home Olympics. 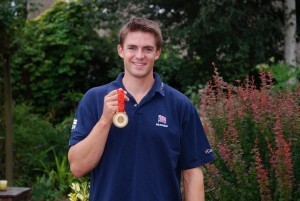 Relating to Beijing 2008, Gold medalist, olympics, Peter Reed, rowing, royal navy, sportsmen. I hope you enjoyed the race! I’ve spoken to lots of people since then that have told me they were on the edge of their seats and screaming at the television, so I hope you’ve recovered from the shock and thanks for the help! The 11 days since the race have rushed by in a whirlwind. Immediately we stepped off the medal podium the madness started and it’s barely stopped since. That night we were taken into a press conference at the Olympic Village that started at 11pm and finished about 3am. I received personal congratulations from the 1st Sea Lord, and then of course there was the interview with Gaby Logan where slow-mo footage of Hodgey telling me he loved me was played to ‘Je t’aime’ – I haven’t been allowed to forget that since. I managed to catch some athletics at the Bird’s Nest (what a stadium! ), some wrestling (where I felt small) and the modern pentathlon (where I saw our girl Heather Fell get a silver). I think that throughout history, every athlete at every Olympic Games will have wanted to crawl under a rock and hide until it’s all over at some point in their preparation. It is difficult not to when you know how big and important one race is. Whether it is 9.7 seconds or 2.5 hours long, you know that other people who are the best in their country, at the peak of their form, are trying to take what you want most in the world; the one thing that you have been working so hard for, for more than 4 years. For the last 3 weeks, I have been at over 2000m above sea level in a remote location in the Austrian Alps with my coach and crew. We come here once a year in the summer to train our bodies harder than at any other point in the season. This is called a ‘work camp’. Relating to olympics, peter, rowing. This is just a really quick one to let you know that I am leaving the comforts of home on Monday for 6 weeks until the Olympics is over. The first stop is a 3 week training camp high up in the Austrian Alps for some altitude training. We live in log cabins, train up to 5 times a day and eat 6000 calories and sleep for 12 hours in order to push our bodies hard enough. The final World Cup regatta in Poland was the last opportunity for us to compare ourselves to the majority of the qualified Olympic opposition. After getting Andy and Tom back into the boat (with their injuries behind them) we knew that we had a lot to do in a short space of time. We finished 2nd to the Dutch crew who we have raced at nearly every international regatta for the last 4 years – it is a big step up from the 8th place of Lucerne, but still not where I want to be and it is hard to hide the signs of disappointment after defeat. Relating to navy, olympics, peter, poland, reed, row, rowing, royal, royal navy, sport.